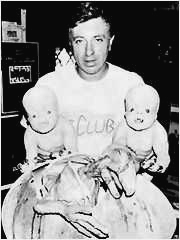 Larry Cohen was born in New York’s Washington Heights district in 1941 and was educated at the City College of New York. He was interested in cinema from a very early age and exhibited a precocious interest in comic books. When working as a pageboy at NBC during the late 1950s, he witnessed the production of many examples of “The Golden Age of Television”, several of which were shot live. As his age was well below the minimum requirement for television writers, he gave his birth date as 1938 (in some filmographies) so he could write for the medium. He wrote several accomplished teleplays during 1958–1961, several of which were transmitted live, featuring performances by talents such as Henny Youngman, Keir Dullea, Peter Falk, Jack Warden and Nancy Kovak. Cohen has always been a great admirer of classical Hollywood cinema and the works of Alfred Hitchcock in particular. Like George Romero, he was actually present while Hitchcock shot Union Station location scenes for North by Northwest (1959). But several years passed before they officially met. After writing several episodes for the acclaimed Herbert Brodkin 1960s television series The Defenders, he relocated to Los Angeles and became the most sought-after writer for television pilots. Cohen conceived the original premises of Branded, the Western television series starring Chuck Connors, by reworking the premises of The Four Feathers from an old movie catalogue he browsed through whilst waiting in a producer’s office. He wrote several teleplays for the series as well as conceiving the idea for The Invaders. Cohen also wrote several excellent scripts for individual episodes of The Fugitive, Sam Benedict and Arrest and Trial. Like Robert Aldrich’s early 1950s television work, Cohen’s usually neglected television work provides indispensable evidence for understanding his later films. Cohen finally met Alfred Hitchcock in the mid-’60s and wrote several screenplays which the director admired. Among these were “Daddy’s Gone A-Hunting”, “Special Effects” (then titled “The Cutting Room”) and “Phone Booth”. Despite Hitchcock’s interest, Universal executives vetoed the proposals. Mark Robson eventually directed Daddy’s Gone A-Hunting (1969). But Cohen’s dissatisfaction with Robson’s direction led to the decision to direct his own work. Cohen’s first film was Bone (1972), a low-budget satirical allegory of Beverly Hills lifestyles featuring Yaphet Kotto, Joyce Van Patten and Andrew Duggan (an actor he would collaborate with several times in the future). Poorly distributed by Jack (The Blob) Harris, who performed a similar disservice to George Romero’s Jack’s Wife (1973), the film has gained a cult reputation over the years. However, Cohen’s connections with low-budget filmmaking and his fascination with subverting established genres has led many critics to not take his work seriously. The director’s strong visual sense of comic-strip humour and satire also conflict with standard definitions of the well-made film, which inhibits serious understanding of his work. Cohen is one of the early “guerrilla” filmmakers who relish the low-budget independence enabling them to approach serious subjects without studio interference. Like his friend Samuel Fuller, a Cohen film often bears the title “written, produced, and directed by Larry Cohen”, making him a fully-fledged cinematic “auteur”. When Sammy Davis Jr turned down Black Caesar, Cohen filmed it in 1973 with Fred Williamson in the title role. The film was a ’70s guerrilla version of the classical gangster movie formula defined by film critic Robert Warshow many years before. After changing the ending to appeal to a black audience, Cohen directed a hastily-conceived sequel in the same year, Hell Up in Harlem. At the same time he began filming the definitive ’70s family horror movie It’s Alive!, released a year later. Drawing indirectly from the work of Hitchcock, Cohen also utilised radical allegory in the film and a subversive approach to one of the most cherished icons of American society – the family. The radical premise saw the American family as highly repressive and destructive of human individuality. Other directors such as Douglas Sirk and Max Ophüls (in The Reckless Moment ) had already made similar critiques within the genre of melodrama. But Cohen used his own interpretation of the horror genre to make a much more devastating critique, revealing that the American family produced the monster, not some outside agency or location (cf. Cold War era sci-fi). The director also collaborated with Hitchcock’s most creative composer Bernard Herrmann during the making of that film. Cohen’s frequent use of satire has often led film critics to misunderstand the nature of his films. He denies that his work belongs to the horror genre and believes that every generic excursion he undertakes transcends formula to make it more critical of American society. If Cohen develops the radical implications in Hitchcock’s cinema, he also employs the master’s humour in his own special way. In 1976, Cohen wrote and directed God Told Me To, which merged themes of science fiction, gender ambiguity, religious imagery and subtle critique of civilized patterns of human behaviour. He also used (and continues to use) veteran Hollywood actors whenever he can. Irritated at the way the Hollywood industry often treats former stars, he offered them work whenever possible. God Told Me To contains two superb cameos by Sam Levene and Sylvia Sidney. In 1977, he cast American television’s former top cop from Highway Patrol, Broderick Crawford, to play the title role in The Private Lives of J. Edgar Hoover, a film also featuring veterans such as Dan Dailey, Lloyd Nolan, Howard Da Silva, Jose Ferrer, Celeste Holm and June Havoc. Private Lives merged elements from his “horror” films to put forth an incisive critique of twentieth century American history in regard to its contamination by repressive authoritarian values and a manipulative political system reaching its culmination in Watergate. Cohen also includes Franklin D. Roosevelt and the Kennedys among his targets and sees no sign of any redeeming values within American politics from the early twentieth century onwards. Cohen criticizes the system from a radical, anti-authoritarian perspective which has no connection with any defined political movement. It is highly anarchic in nature thus lending itself to a satirical angle, leaving answers and solutions open to his audience. Robin Wood acclaimed it as the most “intelligent political film” ever made. Despite acclaim at film festivals, London’s National Film Theatre and television screenings, Cohen’s film did not receive the distribution it deserved. In 1978 he directed the sequel to It’s Alive!, featuring Frederic Forrest, Andrew Duggan and Eddie Constantine. The film developed the radical premise of its original to further extremes. Thanks to Cohen, the monster in the American horror film was seen as emerging from within the family rather than from outside, as in the traditional horror story. Further, It Lives Again now showed that the monster needed protection from society rather than vice versa. 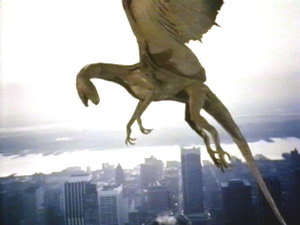 These films also contained implicit critiques of abuses within the American Food and Drug Administration in addition to other features (for instance, the breakdown of technology and the dangerous nature of law and order institutions always eager to seek convenient scapegoats rather than solve real social problems) which escaped the attention of studio executives, who released the works theatrically. Despite his respect for classical Hollywood, Cohen has always been an outsider in the contemporary film industry. He has never been the recipient of studio backing, respect for his talent, and the wider distribution his work deserves. During the 1980s, he collaborated with actor Michael Moriarty on four films. Q: The Winged Serpent (1982) and The Stuff (1985) received theatrical distribution but It’s Alive 3 (1986) and A Return to Salem’s Lot (1987) went direct to video. By this time the industry was changing and the theatrical opportunities for distribution of low-budget films became impossible. Furthermore, the emergence of Ronald Reagan and an increasing conservatism in Hollywood cinema (represented by the reactionary films of George Lucas and Steven Spielberg) affected possibilities for both the production and distribution of Cohen’s type of cinema. During the 1980s, he worked with talents from the New York underground such as Eric Bogosian and Ann Carlisle on films such as Perfect Strangers and Special Effects (both 1984), the latter based on a screenplay originally written for Hitchcock titled “The Cutting Room”. Although Cohen hoped that his homage to North by Northwest, The Ambulance (1990), would receive theatrical distribution, it went straight to video several years after its production. Despite such setbacks, Cohen continued writing screenplays such as Guilty as Sin (finally directed by Sidney Lumet in 1993). 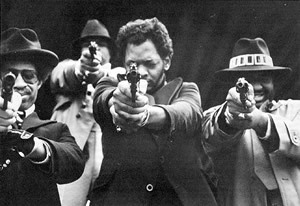 In 1996 Fred Williamson asked him to direct Original Gangstas, which reunited several stars of the old blaxploitation genre such as Williamson, Pam Grier, Jim Brown and Richard Roundtree. Shot in the declining industrial area of Gary, Indiana, Cohen still managed to contribute several of his radical insights (1) to the screenplay. Due to the commercial success of Phone Booth (2002), Cohen has been given the green light to write a new screenplay. When he originally wrote Phone Booth, mobile phones were still of the future, hence the final film mentioning that the main character used one of the last phone booths standing in New York. Cohen’s new screenplay “Cellular” has a plot involving the kidnapping of a woman hidden in the trunk of a car with her cell phone the only means of contacting the outside world. She must save not only herself but her husband and son from being kidnapped, before her battery runs out. The final film will feature Kim Basinger as the heroine and William Macey as a cop. The recent release and acclaim given to Phone Booth owe more to Cohen’s intelligent screenplay rather than the direction of Joel Schumacher. Originally written for Hitchcock and designed to extend the implications of Tippi Hedren’s entrapment in a Bodega Bay phone booth in The Birds (1963), Cohen has contributed a witty, satirical, and subversive screenplay not without the moral implications existing in Hitchcock’s thrillers. Exhibiting the familiarity with his native New York seen in Black Caesar, Hell Up in Harlem, Q: The Winged Serpent, Perfect Strangers and Special Effects, Phone Booth is a film revealing that an auteur may be found in the screenplay, especially if a director follows the axiom of Joseph H. Lewis and others that with a good script 75% of the work is done. John Flynn’s direction of Cohen’s excellent screenplay Best Seller (1985) is another case in point. Larry Cohen is a highly original and resilient talent whose day may yet come in the Hollywood cinema he admires so much. A piece on Cohen’s style. One example involved a dangerous gang member pleading for his life with Williamson on the grounds that he was actually his symbolic son. The world of It’s Alive is not too distant from this film. Also, the political structure of American society does bear some responsibility for the social problems affecting Gary, Indiana. Once a major industrial centre, it is now in terminal decline and has been left to rot. During his presentation of the film at the 1997 AIZEN (Emile Zola and Naturalism) Conference in Los Angeles, Cohen commented that many of the extras seen in the film were probably dead by now. Ironically, filming provided respite from the gang wars that killed many youngsters who had little else to do in an area neglected by the government. The location filming had given many of these young extras not only employment but a sense of personal fulfillment they never had before.